Mother Nature is the master sculptor of the American west and in no place is that more evident than at Arches National Park in Utah. 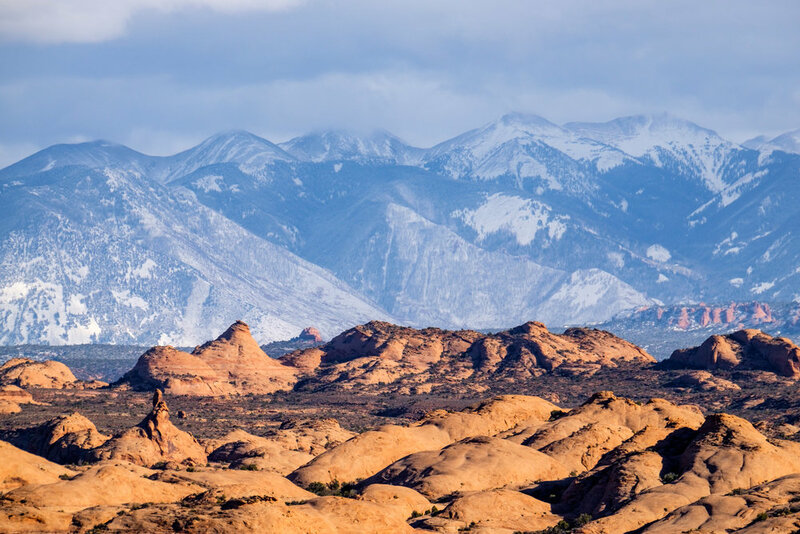 Across the vast landscape of rose-colored sandstone lives more than 2,000 arch formations, and thousands of other wonders in the shape of pinnacles, spires, needles, hoodoos, gargoyles, balanced rocks, and domes that all teem together to decorate the Utah skyline. 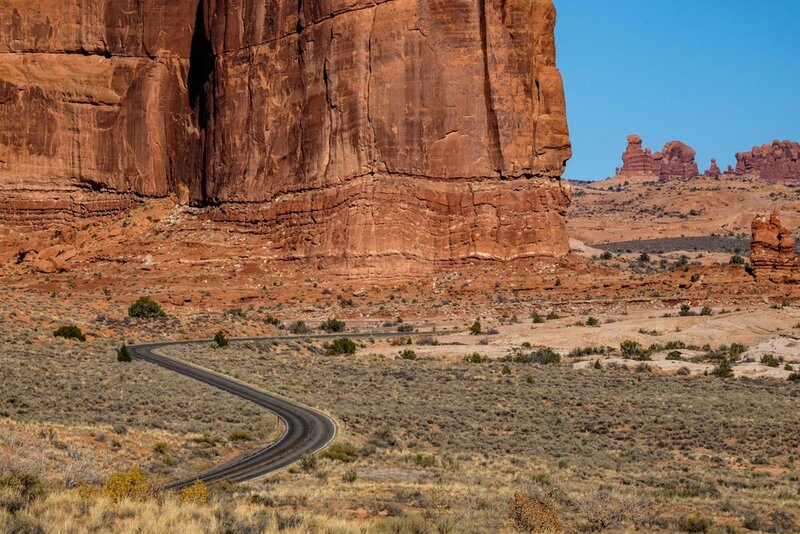 Four miles down the road from Arches is the desert town of Moab, streamlining access between services and the park. You’ve probably heard of it – Moab is legendary to adventurers the world over because of its close proximity to Arches, its neighbor, Canyonlands National Park 28 miles up the road, the snow-capped La Sal Mountains (the second largest range in the state of Utah rising to 13,000 feet), and the adjacent Colorado River. Moab and surrounding landmarks provide a buffet for outdoorsman – where rock climbers, canyoneers, dirt bikers, and whitewater rafters can feast – and the serene southwest setting and desert climate is perfection for landscape photographers who relish in capturing shot-after-brilliant-shot created by the desert sunrise, sunset, blue hour and brilliant night skies. Sandstone formations sillouetted in a sunset sky as seen in the Windows section of the park. Layers of landscape during the "blue hour" just after dusk. 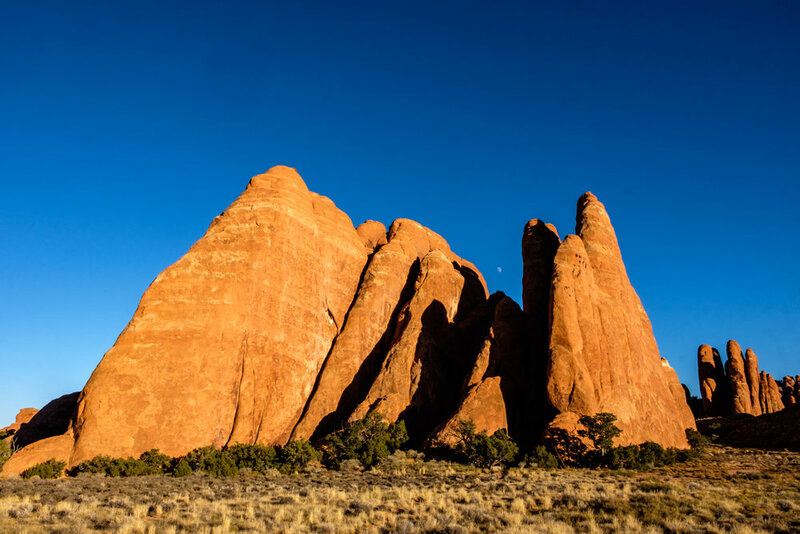 With thousands of arches and other intriguing formations rising from the rugged landscape, and with remarkable hikes leading to most of them, it can be a real challenge to determine what to see and do with a limited amount of time in this red rock wonderland. The first step is to head off on the 26-mile scenic loop drive inside of the park; the second is to choose which landmarks in the area speak to you. We've highlighted below what we think some of the top stops are in hopes that it will help other travelers maximize their time and help focus photo ops while visiting this jewel in the American Southwest. 2. 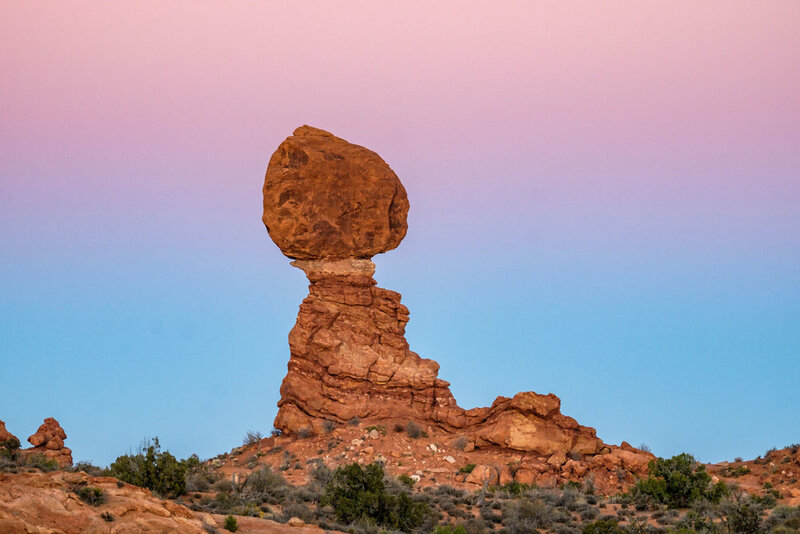 Balanced Rock is a massive boulder made of Entrada sandstone that sits atop a pedestal made of Dewey Bridge mudstone – fused together, they become stronger. The perch is 128 feet tall and together they are estimated to weigh 3,577 tons (about equivalent to 27 blue whales.) With tons of great hiking nearby, striking scenery in every direction, and its close proximity to the paved park road, it is as easy to explore as it is popular. 3. Double-O Arch (not to be confused with Double Arch, not featured in this section) is made up of two arches standing on top of each other seeming to dance in infinity. It is one of the great sunset spots in the park. You'll want to make your way out there in the mid-afternoon to catch the sunset and be hiking back to the trailhead as soon as the golden hour ends to beat nightfall (it's about 2 miles between Double O and the Devils Garden trailhead.) Don’t forget your headlamp! 4. 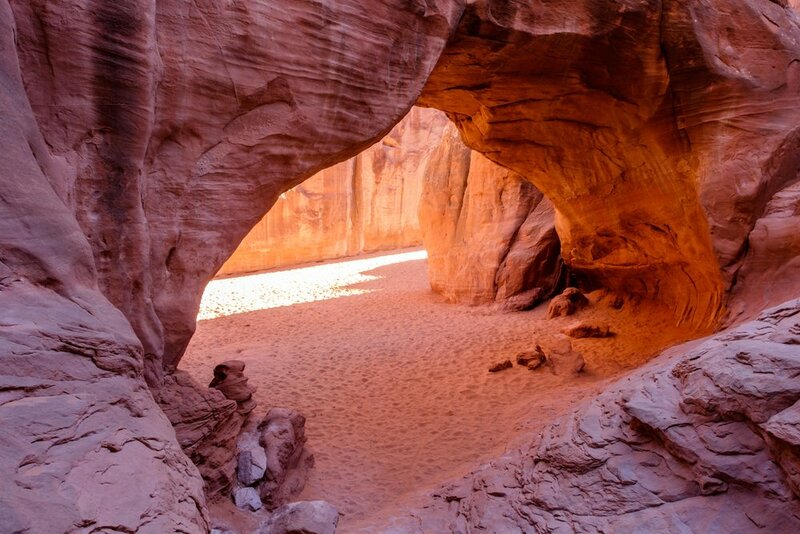 Fiery Furnace is a fascinating maze of sandstone passages weaving through towering walls that have been etched by erosional forces over the course of millennia. The labyrinth can only be visited on a ranger-led hike or with an NPS-issued permit from the visitor center used to vet would-be hikers (GPS doesn't work in Fiery Furnace and getting lost is a relatively common occurrence.) As is always true in our national parks, your safety is your own responsibility! 5. Turret Arch is relatively young and small and is framed perfectly through North Window, making it a beloved photography subject in the park. It is one of three arches on Windows Loop Trail. 6. North Window is a sunrise photographer’s dream, where one can perfectly frame Turret Arch in the center of its wide opening. It can be a frustrating place to shoot because people are constantly posing in the arch-way... sometimes it is just best to just loop them into the shot. 7. The Park Avenue viewpoint is a stunning scene and is one of the first landmarks reached after entering the park on the scenic loop road. Be sure and take some time to wander down into the wash of sandstone and absorb the scenery around you – Queen Victoria Rock, Sausage Rock, and Courthouse Towers are all nearby. But don't walk on the crypto! 8. Landscape Arch has one of the longest spans of any natural arch in the world, and the largest in North America measuring at 306 feet. It is easy to access along the Devils Garden trail area right off of park road. 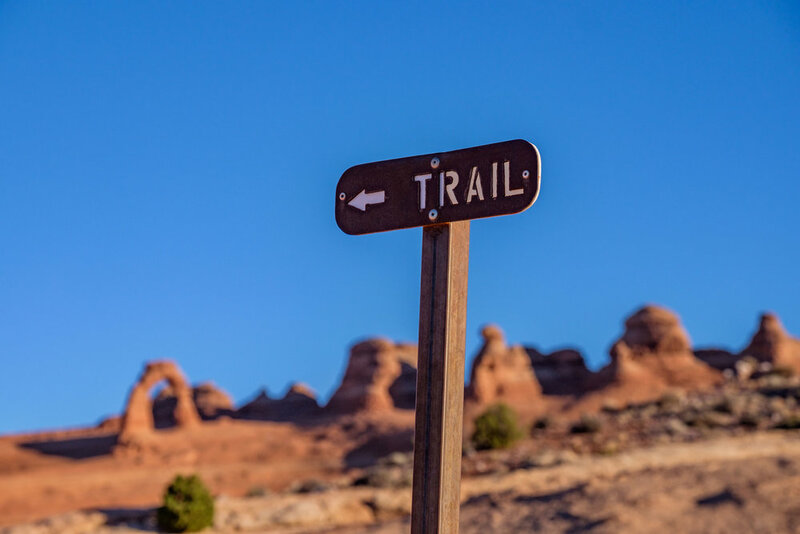 Wander farther onto the primitive trail and visit Double O Arch, as well as Navajo and Private Arches to get the most bang for your buck. 9. The Three Gossips is a statuesque formation named for its striking resemblance of three people chatting (er, gossiping.) This mid-size formation that stands at 350 feet is located near the Courthouse Towers in the Windows section of the park. 10. Navajo Arch, located on the Navajo Arch Spur Trail, feels like more of a cave than an arch, and it tends to be a bit less visited than other well-known arches in this network of trails which can allow for a bit of uncommon solitude. 11. 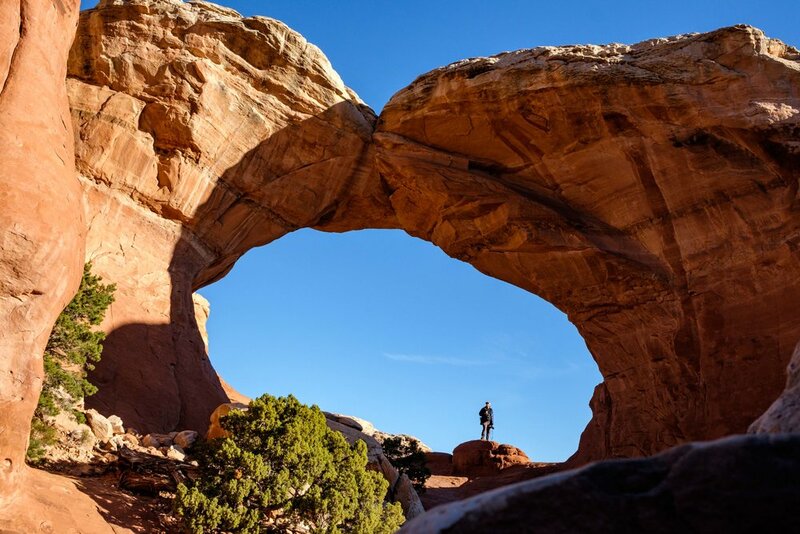 Partition Arch is a window-shaped arch that can be found on foot on the way to Double-O Arch on Navajo Arch Spur Trail. It shares the same backbone (fin) as Landscape Arch and shares a picture-perfect view of the landscape as well. 12. Courthouse Towers can be viewed near the Park Avenue viewpoint just 9 miles after entering the park. This beautiful wall of sandstone proves early on in any visit that there is much more to this park than just arches. 13. Broken Arch is a huge picture window in the north area of the park with easy hiking surrounding it. The 2-mile trail from the parking lot is a favorite during wildflower season when the area is awash with colorful blooms. 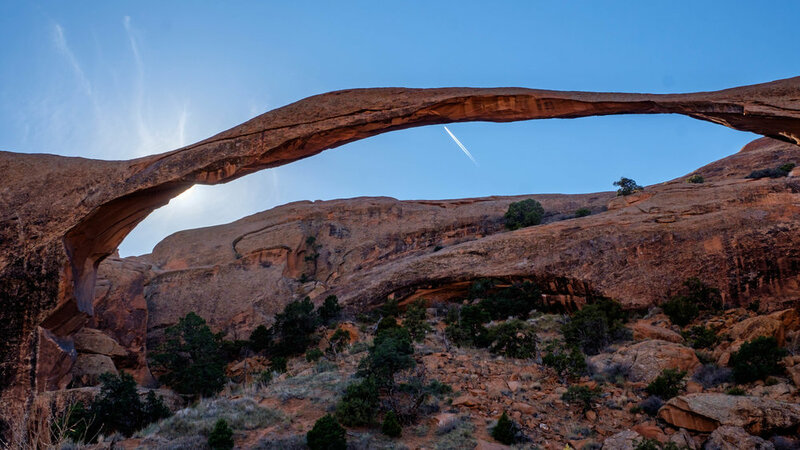 Despite its name, Broken Arch is not broken, just wearing thin over time. 14. Sand Dune Arch is a fun and easy place for kids of all ages to explore being that it is located just next to the parking lot, has no elevation gain/loss, and the ground-scape is covered with soft sand. This is a great place to practice abstract photography by playing with the large streams of shadow and light that dance in through the slotted fin walls. 17. The Petrified Dunes at Arches are remnants of ancient sand dunes that have hardened to stone over time. This uniquely beautiful oddity can be seen off-road in the Windows section of the park, with the snow-capped La Sal Mountains hanging as a perfect backdrop behind them. The fragile ground seen on either side of this stair case is covered in cryptobiotic soil. There are more than enough reminders throughout the park to stay on the trail! 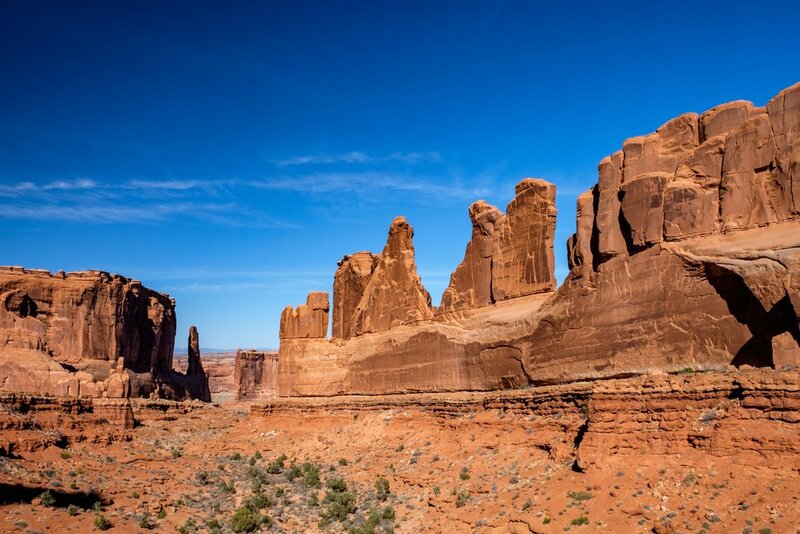 How the park got its name: Arches National Park in Utah earned its name for having the largest collection of sandstone arch formations in the world. There are more than 2,000 on record. Delicate Arch – Utah's crown geologic jewel – as seen from the Upper Delicate Arch Viewpoint. Iconic site in the park: Delicate Arch is not only the most iconic site in this national park, but it is the emblematic symbol for all of Utah – a perfect arch carved over the course of millennia, delicate stone of vibrant orange juxtaposed against a sky blue sky. 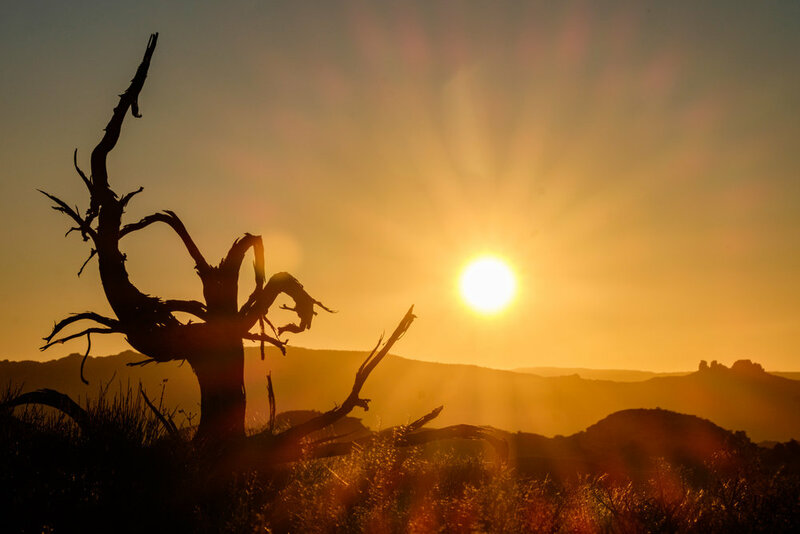 At any given time of day there are people standing beneath it, waiting their turn to take in the view when it is lit up by the desert sun, ready to enjoy the real depiction of the Utah of their dreams. The iconic stone formation is the largest free-standing arch in the park and was named for its delicate chisel – it is pretty remarkable to see up close, delicate indeed, looking like it could topple onto the landscape at any time. 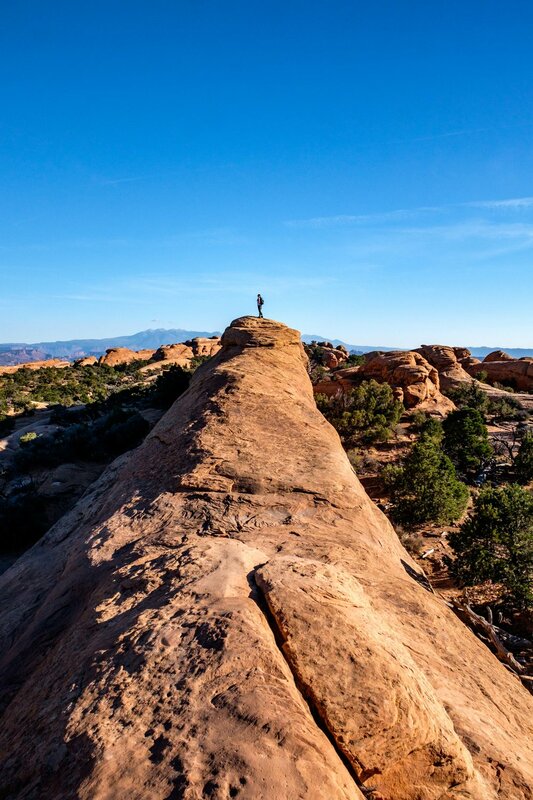 To get the up-close experience, head to the Upper Delicate Arch Viewpoint (the main viewpoint) bringing you right up to the base of the formation after a short hike. The Lower Delicate Arch Viewpoint provides an interesting vantage point that is less often photographed and with an easier hike leading to it than the higher viewpoint. 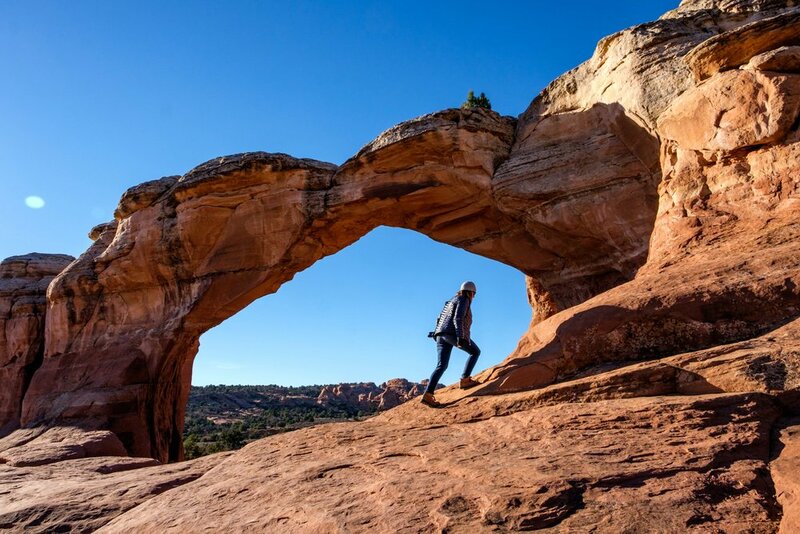 Accessible adventure: Hiking the Devils Garden network of trails is a super fun way to see a variety of arch formations (there are 7) while making way to two of the most famous arches in the park: Landscape Arch and Double O Arch. The hike to Landscape Arch is relatively easy on flat, wide trail leading directly from the parking area at the Devil's Garden Trailhead. After Landscape, the fun continues along on a 4-mile out and back primitive trail with stops at other carved formations including Navajo, Private, and Partition Arches. While this hike does pass through some areas of light exposure while crossing finned ridges, as well as bouldering, we mark it here as "accessible" because there were plenty of children making the hike with their parents and they looked to be having an easy (and wonderful) time – just as the rest of us big kids were! 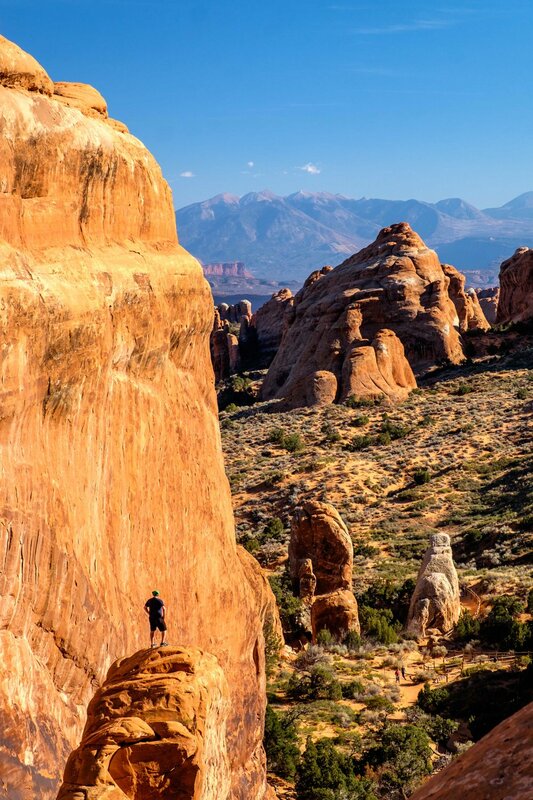 Rock climbing is a favorite sport at Arches National Park. 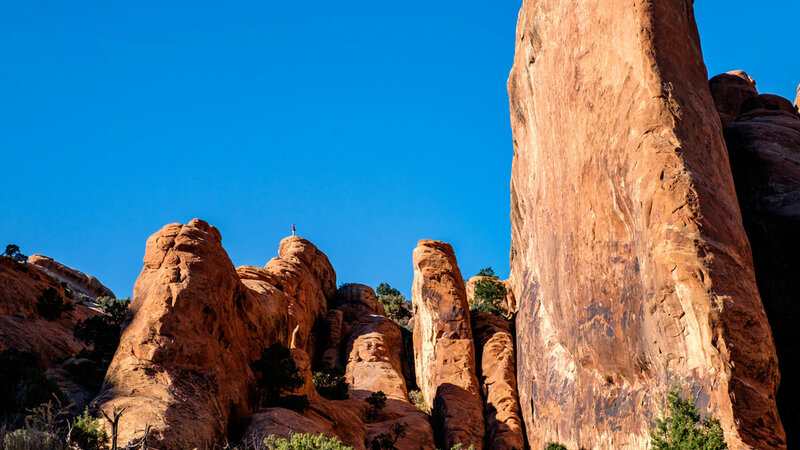 Big adventure: Arches is a favorite national park for rock climbers. 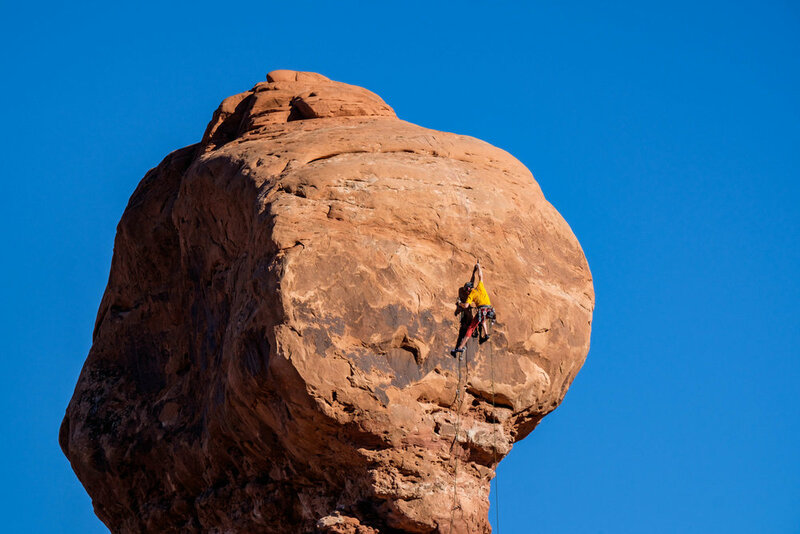 Long before the late Dean Potter (a climbing legend who earned fame first at Yosemite) ever scaled the Delicate Arch formation (causing much controversy) climbers have been drawn to the this area for the soft Entrada sandstone that lends perfectly to the sport. Multi- and single-pitch towers lined with hard, cracked buttresses rise up to 300 feet from the park floor, begging technical climbers from around the world to scale them en route to perches located high above the largest collection of arches found anywhere in North America... in the distance, a backdrop of sprawling canyonlands that have nurtured the formations for millennia, enabling them to sprout into the sky, look on. There are regulations in place for climbers so it is vital to check in with the park service at the visitor center before heading out to start your route. Also, check out the Arches NPS website for more info. After that, go big! 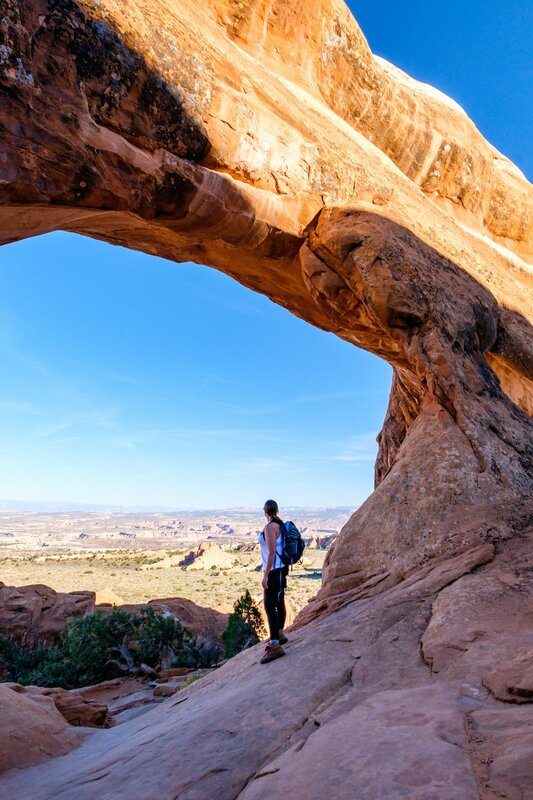 The very fragile Landscape Arch has the widest opening of any arch in North America. To be classified as an arch in this park, the opening must measure at least three feet across. The opening of Delicate Arch measures 46 feet across. The opening of Landscape Arch is 306 feet wide, the largest of any arch in the park and in North America. 43 arches in the park have collapsed since 1977. In 2008, the 12-foot wide Wall Arch formation fell to the ground (thankfully it didn’t injure anyone.) At the time, it was the 12th largest arch in the park. Every arch in the national park will fall someday. Delicate Arch is seen on the Utah license plate and on the state 'America the Beautiful' commemorative quarter issued by the U.S. Mint. Double Arch (not included in our list of must-sees featured at the top of this page) is one of the more famed arches in the park as it served as a backdrop in the film Indiana Jones and the Last Crusade. It is located near Window Arch and can be a little tough to find but the Visitor Center can help you out. Wally the Airstream had no trouble trekking the scenic park road. The 26-mile park loop road is RV/trailer friendly! The Olympic torch relay during the 2002 Winter Games in Salt Lake City, Utah passed through Delicate Arch. American author Edward Abbey was a park ranger at Arches during the 1950s. His experiences from that time inspired his wildly successful novel Desert Solitaire, one of the classics of American literature. "Rock Strata" refers to the sequence of age shown in rock layers, the youngest being on top and the oldest on the bottom. The Old Spanish Trail, a historic trade route between L.A. and New Mexico, passed through where the Arches National Park Service Visitor Center stands today. It also passed through Mesa Verde, Great Sand Dunes, and Black Canyon of the Gunnison National Parks (all in Colorado); as well as Bryce Canyon in Utah. Today, it remains a National Historic Trail that is protected by the U.S. National Park Service. Ancestral Puebloan, Ute, Shoshone, and Paiute Indians once lived in the area and have left behind artifacts depicting their inhabitance there, including rock art and stone tools carved from native quartz. Petroglyphs in the park show a recorded human history dating back more than 10,000 years. We owe a debt of gratitude to the Civilian Conservation Corps who worked for 9 years in the 1930s and 1940s to improve access to the American wild. In the 1940s, the Civilian Conservation Corps (CCC) built roads and buildings in the area extending access into what is now the national park. The work began during the Great Depression as a way to put American men to work; it lasted 9 years and employed 3 million people. In 1942, the conclusion of WWII put an end to the work. Arches National Park was one of the last parks to undergo modifications made by the CCC. There are hundreds of miles of dirt-biking trails for all skills levels on all kinds of terrain in and around Moab. One of the favorites is the Le Sal Mountains, which can be seen clearly from the national park. Some of the most popular activities in the park include camping, hiking, rock climbing, canyoneering, backpacking, auto-touring, and dirt biking. There is one camping area in the park, the Devils Garden Campground. It is closed for the 2017 season for a restoration project. There are tons of camping opportunities located outside of the park. See this NPS provided Campground Information sheet for locations. 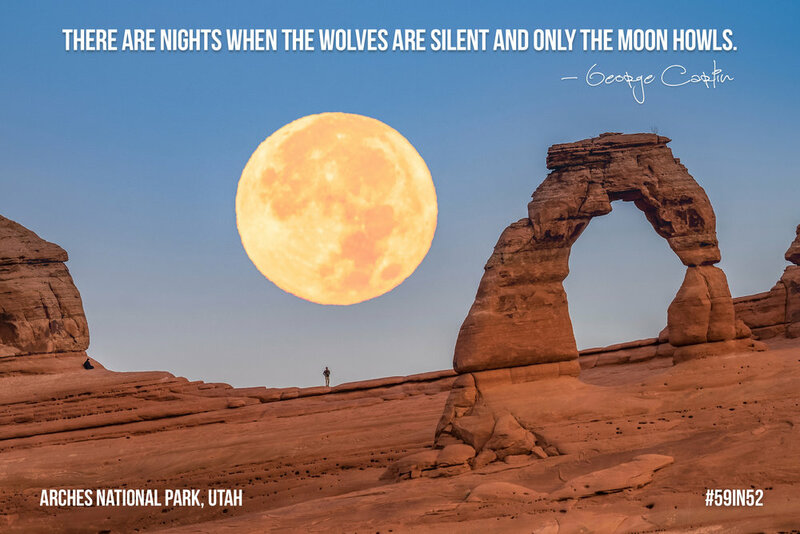 A November 2016 supermoon hugs the horizon in Arches National Park. Even though the nearby town of Moab is growing larger by the day, there are still beautiful night skies to be seen in Arches National Park. Monsoons occur during the stormy summer season in Arches, posing a threat to hikers and explorers who may get caught in flash-flood conditions. The water from such storms fills naturally occurring depressions in the soft stone, called “pot-holes,” which serve as drinking vessels for wildlife parched by the hot and dry climate. Arches National Park can be seen in the opening sequence of the third Indiana Jones movie; as well as many other films including City Slickers, Thelma and Louise, and the religious biopic, The Greatest Story Ever Told. Famed rock climber and BASE jumper, the late Dean Potter, climbed Delicate Arch in 2006 without support of ropes or other support (called a free solo.) At the time, the language in the park literature absconded him from wrong-doing (though the action stirred much controversy while damaging his relationship with his sponsors, most notably, Patagonia.) The language has since been updated to reflect new regulations prohibiting climbing on delicate sandstone formations in the park. 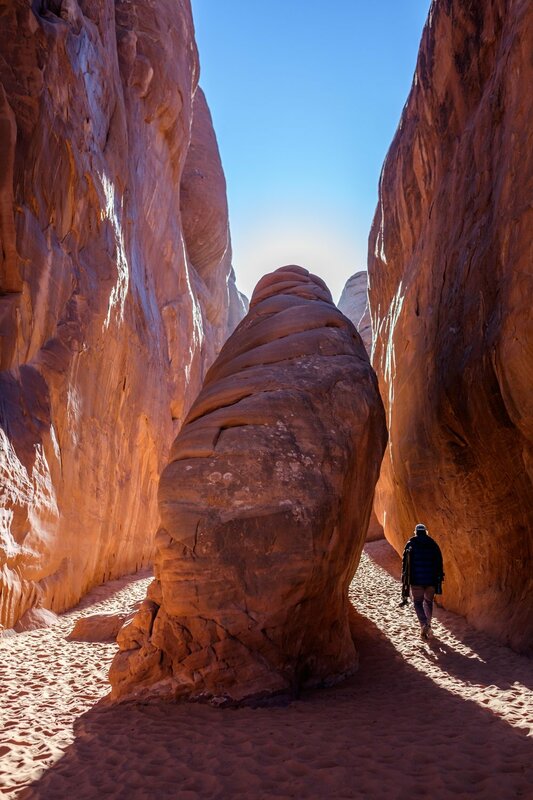 Jonathan walking inside of sandstone fins to Sand Dune Arch. Landscape photographers come to the area for the contrasted geology and unmatchable beauty. You will rarely find a sunrise in the park without the company of many other photographers at anytime of the year. Temperatures in the park can fluctuate 50 degrees on any given day. Arches National Park is adjacent to the Colorado River. Altitude ranges from 4,000-5,600 feet. 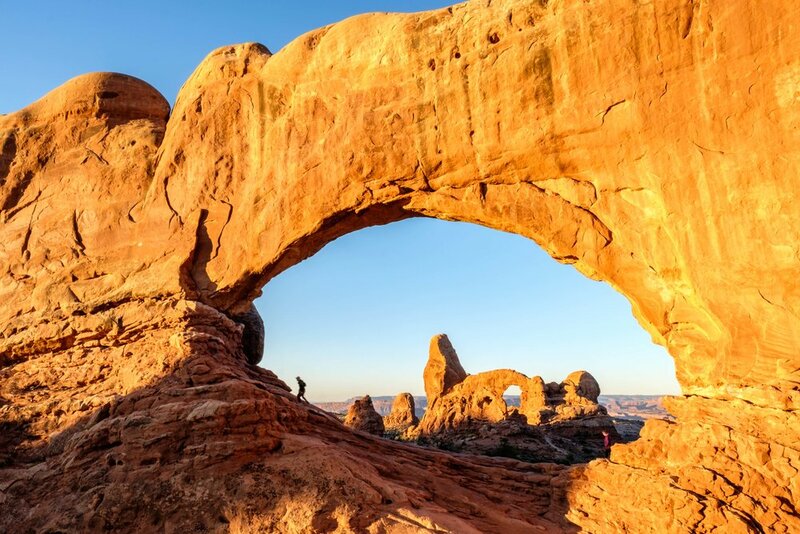 The five national parks in Utah are dubbed "The Mighty 5" by the state tourism board. They include: Zion, Capitol Reef, Canyonlands, Bryce, and of course, Arches. 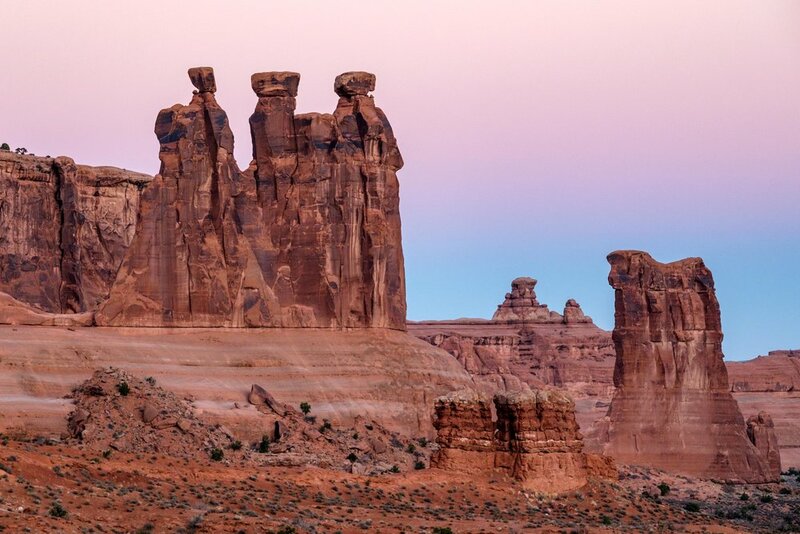 Utah parks are some of the most visited in the entire system. Acrophobia is the fear of heights/exposure. 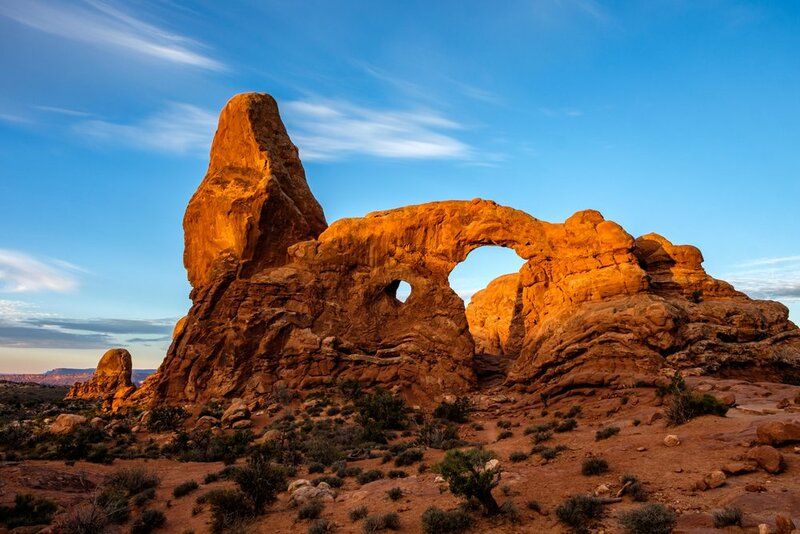 There are certain areas at Arches, such as the Devils Garden hike, where this might cause trouble for some visitors. If that could be you, one smart hack is to find out what a trail is like in advance by watching YouTube videos of others on park trails. Don’t forget to check out the webcams to get a sense of how busy certain areas are before heading in. During 2016, the centennial anniversary year of the U.S. National Park Service, Arches recorded 1,585,718 visitors. 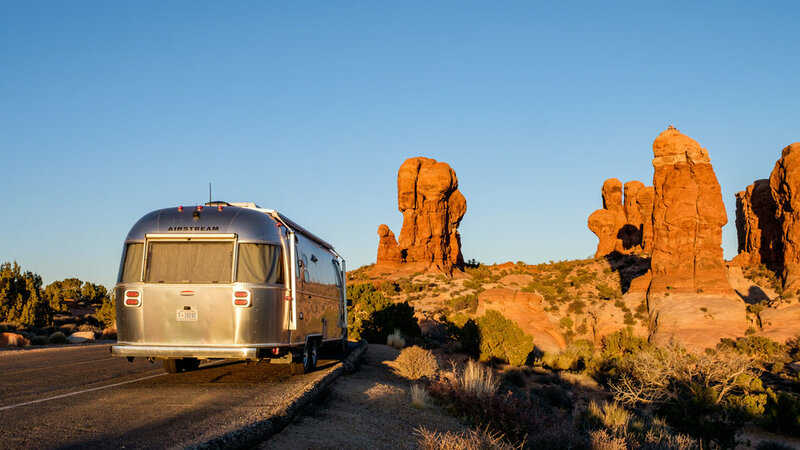 Wally the Airstream on the road in Arches National Park.